Do Leaked Text Messages Prove RHONY's Bethenny Lied about Carole? Bethenny Frankel appeared to make a connection with Brian, but later claimed she had no romantic interest in him despite his relentless attempts to date her. And right after Bravo aired that speed dating episode, Bethenny wrote a blog in which she claimed she tried to set up her co-star Carole Radziwill with Brian the very same night of the speed dating event. However, Brian just gave an interview in which he reveals that was an absolute lie by Bethenny, and that she was actually very interested in pursing something with him… until he showed interest in Carole. Even more, the 53-yr-old lawyer and entrepreneur released the text messages he exchanged with Bethenny, and it definitely appears to back up his version of the story. In an interview with the Shira’s Got The Scoop blog, Brian first makes it clear that Bethenny, while reading out his text messages on the show, conveniently forgot to include the messages she was sending to him as well. Brian then revealed that Bethenny’s claims that she tried to set him up with Carole the same night of the speed dating event is simply not true. According to him, she was actually very interested and tried to set up a date with him after the event. He says she only lost interest once he showed interest in Carole. 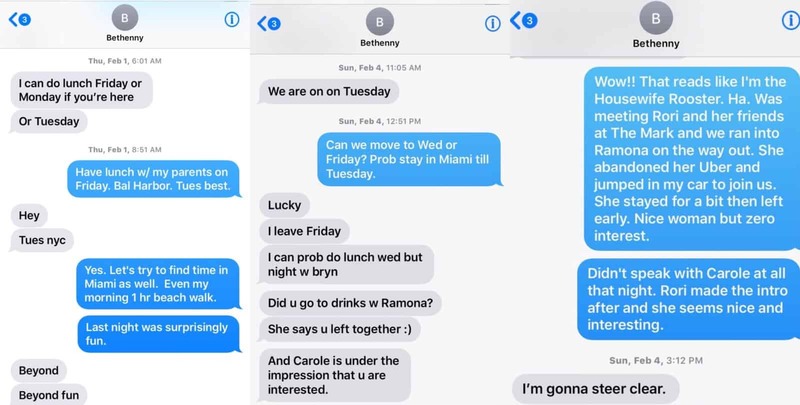 To prove his side, Brian released the text messages he exchanged with Bethenny. “Here are screenshots of the actual texts between us. It’s kind of brilliant how this became “he won’t stop texting me.” You decide. I’m blue. Bethenny is grey. By the way, I’m out of the reality show business. It’s insane!” he wrote. Those messages are below. Brain said he hopes Carole will be able to set the record straight at the reunion. As for why he filmed for the show, he says he simply did it to help promote his friend’s matchmaking business. As for Bethenny, he says they no longer keep in touch. TELL US – DOES THIS PROVE BETHENNY LIED?